'Chakra' is a Sanskrit word, meaning wheel. The human body has seven main chakras - areas of spinning energy - from the base of the spine to the crown of the head. Sometimes it is necessary to re-balance the chakras. Each chakra influences a different organ and emotion within the body, and has a certain colour associated with it. Base - red/black. Sacral - orange. Solar Plexus - yellow. Heart - green. Throat - light blue/turquoise. Brow - dark blue. crown - violet/white. The semi precious stones used in our chakra jewellery have been chosen to work with the different energy centres and may restore balance. There are currently 20 images on this page. 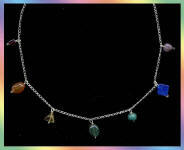 Pretty Chakra necklace with unusual shaped stones. Tigers Eye rounds and Garnet triangles. Garnet, Carnelian, Citrine, Green Aventurine, Turquoise, Lapis Lazuli and Amethyst. Length : 16inches with Silver clasp. with silver beads and silver lobster clasp. spaced with Silver flasks, daisies and round beads. Length ~ 17.5 inches with a Silver toggle clasp. 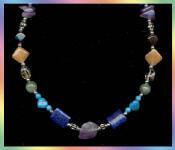 Beautiful colours and shapes make up this Chakra necklace. With a central Amethyst nugget, Amethyst chipstones, Blue Aventurine oblongs. spaced with silver beads and silver toggle clasp. spaced with Hematite drum beads. Length ~ 18 inches with silver clasp. Bracelet to match Chakra necklace No. 28. Length ~ 7.5 inches with silver clasp. Length : 7.5inches with a Silver clasp. 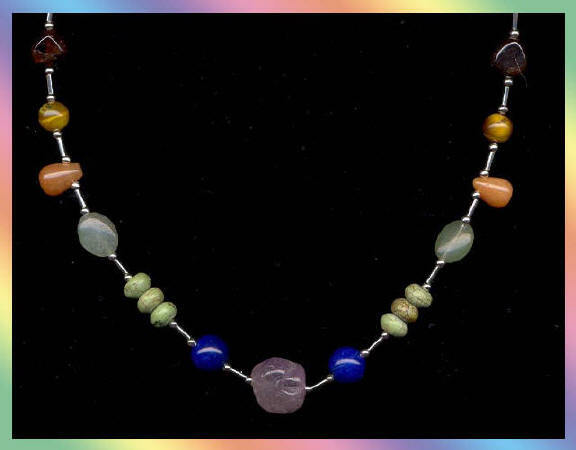 Hematite, Carnelian, Citrine, Green Aventurine, Turquoise, Sodalite and Amethyst. Length : 8 inches with a Silver clasp. Hang this little dangler on your mobile phone, plant or in your car. spaced with clear Swarovski crystals and finished with a clear quartz crystal nugget. with liquid Silver and Silver clasp. Sodalite, Blue Lace Agate and Amethyst. Length : 7.5 inches with a Silver clasp. with Silver beads and clasp. Amazonite (not Blue Lace Agate as shown), Sodalite and Amethyst. Length : 16 inches with a Silver clasp.